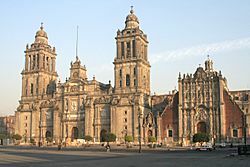 The Metropolitan Cathedral of the Assumption of Mary of Mexico City or the Mexico City Cathedral is a cathedral in Mexico City. It is one of the oldest and largest cathedrals in the Americas. The cathedral was built from 1573 to 1813 around the original church. The original church was built soon after the Spanish conquest of Tenochtitlán. The new cathedral eventually replaced the church entirely. Tabernacle's southern façade, opening out towards the Zócalo. Chapel of Our Lady of the Agonies of Granada. View of an organ case from outside the choir area. Simon Pereyns, San Cristobal, 1588. General Scott's entrance into Mexico, 1851. Plaza Mayor do Mexico (today Zócalo), 1836. Mexico City Cathedral Facts for Kids. Kiddle Encyclopedia.